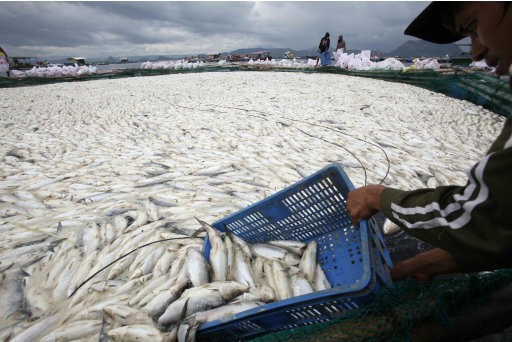 TALISAY, Philippines (AP) — More than 800 tons of fish have died and rotted on fish farms in a lake near Taal volcano south of Manila, with authorities blaming it on a sudden temperature drop. The massive fish deaths started late last week but have eased. Officials have banned the sale of the rotting fish, which are being buried by the truckload in Talisay and three other towns in Batangas province, Bureau of Fisheries and Aquatic Resources official Rose del Mundo said Sunday. The deaths are unrelated to recent signs of restiveness in Taal volcano, which is surrounded by the lake where many villagers have grown milkfish and tilapia — staple foods for many Filipinos, officials said. The volcano and lake are a popular tourist draw. Government volcanologist Allan Loza said Monday that 115 earthquakes were detected in Taal in the past 24 hours compared to an average of 10 to 15 quakes daily in recent weeks, a sign that magma is rising from within the small volcano. Such unrest has been monitored since April, long before last week's fish deaths, he said. Talisay agricultural officer Zenaida Macatangay said an initial investigation showed the deaths may have been caused by the temperature change as the rainy season set in last week after a scorching summer, which also depleted the lake's oxygen levels. More than 400 tons of milkfish have died in Talisay alone since Friday in 84 out of about 1,000 fish pens — lake areas about half the size of a basketball court that are fenced off by bamboo poles and nets. Damage has been estimated at $770,000 (33 million pesos), Mendoza said. About 400 tons more have died in the other towns.